It was a dark and stormy night- both outside with snow falling on the streets of St. Louis and inside where snow is hindering the guests who are gathering at Monkswell Manor- now a bed and breakfast in the English countryside. 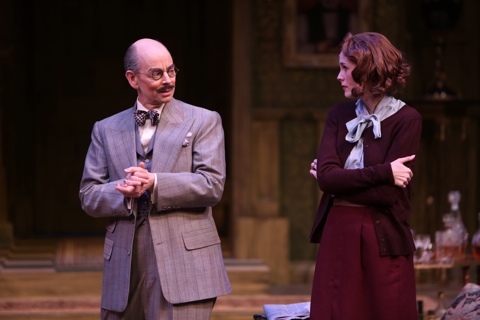 It’s the classic murder mystery, “The Mousetrap,” by the grande dame of mystery, Agatha Christie. I’m sure this clever show has played in our area before but this was my first time seeing it on stage. 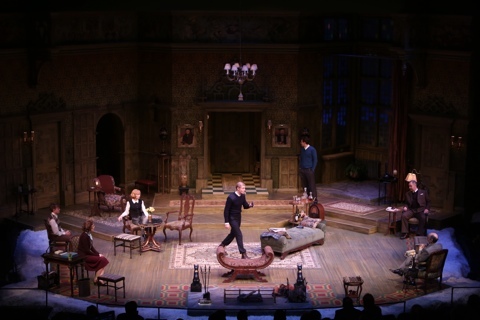 It’s loads of fun with quirky characters, loads of red herrings and a constant, low buzz in the audience (particularly in the second act) as some “ah-ha” moments seemed to prove some folks wrong- or were they? A perfect holiday show at the Repertory Theatre of St. Louis- hey, if it can’t be a musical, I’m fine with this delicious, intriguing cat and mouse story. Superb direction by Paul Mason Barnes (winner in many categories at last year’s St. Louis Theatre Circle Awards for “A Comedy Of Errors” at the Rep) helps move this suspenseful play through exposition and into surprise after surprise as we try to discover if the local killer who has strangled several women is among the guests as they arrive at the B&B which now has them all trapped due to the snowstorm. Mollie and Giles Ralston inherited the manse and decided to convert it instead of selling it. Little skilled in the running of such an establishment, they soon find themselves in over their heads with lack of preparation and then this whole murder thing which has all of the guests either jumpy or ecstatic (even more conducive to red herrings). Ellen Adair is simply wonderful as the bewildered wife, Mollie, who tries to make the best of a bad situation. As her husband, William Connell also shines and, of course, during the evening, they both look guilty at one time or another. The first guest to arrive is Christopher Wren, whose parents named him hoping he’d grow up to be an architect- and that’s exactly what happened. It seems his appearance brought the Christmas “fruitcake” on the scene a bit early. Sean Mellott gives him a manic performance with telling dialogue and actions with a propensity of non-sequiters. The wonderful Darrie Lawrence arrives next in the role of Mrs. Boyle. Particularly critical of the way the establishment is run, she can’t seem to get along with anyone. Major Metcalf arrives and Michael James Reed brings a proper stuffiness to the role as he seems to play casual observer to the actions of the hyper-guests bouncing around him. Finally we get Miss Casewell, played with a demure, reserved quality by Tarah Flanagan. But does her cool demeanor hide more sinister thoughts? Then we get an unexpected guest who claims his Rolls-Royce had run off the road into a snowbank. Larry Paulsen plays Mr. Paravicini with an odd mix of creepiness and bursts of gleeful laughter. Add to the guests Christian Pedersen as Detective Sergeant Trotter who enters to make sure all of the guests are who they say they are as he informs the household of the maniacal killer who may have decided to use the manor as a cover for his nefarious deeds. John Ezell has set the perfect mood with his eerie and foreboding interpretation of the Great Hall at Monkswell Manor. Peter E. Sargent’s lights add to the mood and Dorothy Marshall Englis has provided just the perfect costume plot to go along with the intriguing mystery plot. Rusty Wandall brings his special touch to the proceedings as well with excellent sound effects including the chilling announcements from the radio about the killer as the play begins. 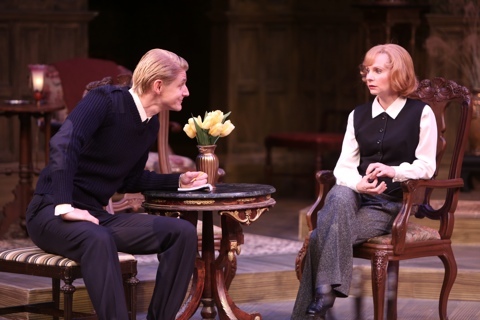 At intermission, like everyone else, we discussed the myriad of possibilities about the killer on stage. Recalling some of our other favorite Agatha Christie plots in her great books, we decided it will never be who any of us thinks. Her interesting twists in books like “The Murder of Roger Ackroyd,” “13 At Dinner,” “Murder On The Orient Express” and so many others have taught us all one thing for sure- you can never count anyone out as the murderer in a Christie novel (or play). We defy you to guess the final, few exciting minutes. Congrats to Director Paul Mason Barnes, Steve Woolf and the rest of the “usual suspects” at the Repertory Theatre of St. Louis for bringing us a perfectly delightful holiday treat. 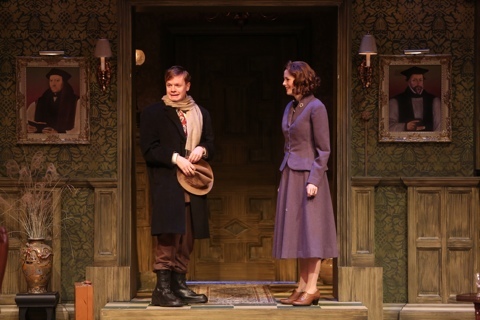 “The Mousetrap” plays at the Rep through December 29th. Give them a call at 314-968-4925 or visit repstl.org for tickets or more information. This entry was posted on December 8, 2013 at 9:43 pm12 and is filed under Uncategorized. You can follow any responses to this entry through the RSS 2.0 feed. You can leave a response, or trackback from your own site.